The Grant County Economic Development Council (GCEDC) has completed the 2019 Grant and Adams Counties Wage & Benefit Survey. The last time the survey was completed was in 2014. Previously, GCEDC used a company called Pathways but since that time, the company stopped providing services such as a wage & benefit survey. Allan Peterson, a certified Business Adviser with the Small Business Development Center (SBDC) and GCEDC is able to have in-depth market research completed for clients through the SBDC Market Intelligence Research Program. In 2018 the GCEDC turned to the SBDC which is based out of Washington State University (WSU) to help facilitate the survey. The GCEDC was able to work with Tim Taylor, Supervisor of the Market Intelligence Research Program at WSU and his team of interns to create, model, compile and report the findings of the survey. This survey is completely anonymous to better serve our local industry in helping make decisions about their wages and benefits. 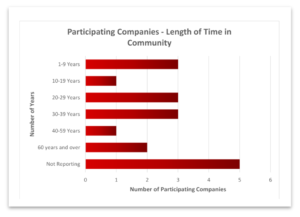 18 companies participated in the survey from Grant County and Adams County. Industries participating included: food processing, distribution, manufacturing and data centers. 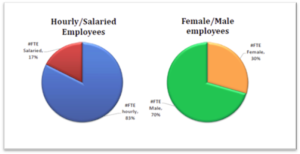 Most employees are hourly paid, while 70% of the workforce is male. 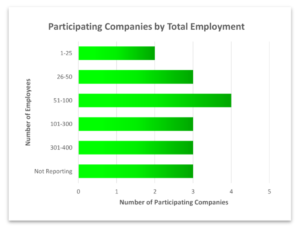 More than half the companies reported offering a shift differential. For the full report see the GCEDC website under economic reports.